The battle for the Aviva Premiership crown intensified in the shadow of the Six Nations this weekend with some outstanding individual performances - but who did enough to earn selection in our Team of the Week? The in-form fullback produced a busy display as Quins returned to winning ways against Sale at The Stoop. Brown defied the boggy conditions to collect his own kick ahead before crossing for his side's second try. 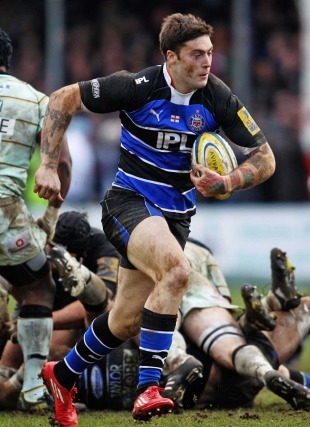 Banahan was at his rampaging best as Bath put Northampton to the sword at The Rec. The England international grabbed a hat-trick of tries but his bulldozing run and sublime off load for team-mate Matt Carraro's try topped the lot. The strong-running Tigers centre kept Wasps busy at Welford Road with another busy display that may not have brought him a try but underlined his worth to a side stripped of many of its internationals. A neat break lead to lock Steve Mafi's try and he racked up a team-leading 60m with ball in hand. Barkley has returned to Bath No.12 shirt with team-mate Shontayne Hape on England duty and he looked very much at home as he helped give the Saints the runaround at The Rec. Often a key link man for his increasingly confident side, Barkley also weighed in with five conversions and a penalty. The Cherry and Whites' winger was in top form as his side climbed to third in the table thanks to a victory over London Irish at Kingsholm. In on e of a series of telling contribution, the former Wasps star made a searing break in the lead up to Akapusi Qera's try. The Irish playmaker steered the Tigers to victory over old rivals Wasps at Welford Road. The former Wasp pounced on a loose pass from opposite number Dave Walder before racing away for his side's opening try wand also notched three penalties and a conversion. The former England scrum-half helped set an impressive tempo as Sarries kept the pressure on leaders Leicester with an easy victory over Leeds - and coasted through one of many holes in the visitors' defence to notch a try. The tough Gloucester loose-head took a starring role at Kingsholm as the hosts dismantled London Irish with a powerful forward effort. Looked hungry for work in the loose and did not shirk his duties in the set-piece or in defence. The pick of a dominant Quins pack that outmuscled Sale at The Stoop. The talented 22-year-old also capitalised on some slack defending to notch his first Premiership try and could have had another if a pass from Mike Brown had gone to hand. The Bath tight-head shrugged off a recent citing to put in an impressive day at the coal face against Northampton's formidable front row resources at The Rec. Pinged a couple of times by the referee but his industry and tackle count demanded selection. The Tongan international lock galloped through to score the Tigers' second try against Wasps as part of a solid display at Welford Road. Not shy of work in the loose, he also featured strongly in the lineout and notched his share of tackles. The USA Eagles international lock picked up the man of the match honour at Vicarage Road where Saracens swept strugglers Leeds aside thanks largely to Smith's outstanding display. Skirving made way for England captain Lewis Moody after an hour of his side's mauling of Northampton but not before setting is side on their way to an impressive victory. The driving force behind much of Bath's play, he proved a thorn in the Saints' side throughout. The Fijian international entered the fray at Kingsholm as a replacement for Andy Hazell and wasted no time in making his mark as part of an all-action Gloucester pack. Racked up a bone-crunching 13 tackles and also got on the end of a neat move for his side's second try. Another key player in Gloucester's recent resurgence, Narraway continued his rich vein of form against London Irish at Kingsholm where he was at the heart of a dominant Cherry and White pack. The England international set the tone with the opening try and could add to his two caps if he continues to deliver quality performances such as this.